Vienna is one of our favorite cities in the world. And the most beautiful season to visit it in our opinion is spring! We’ve already told you about all the things we love in the city, this time we’d like to show you our favorite parks. 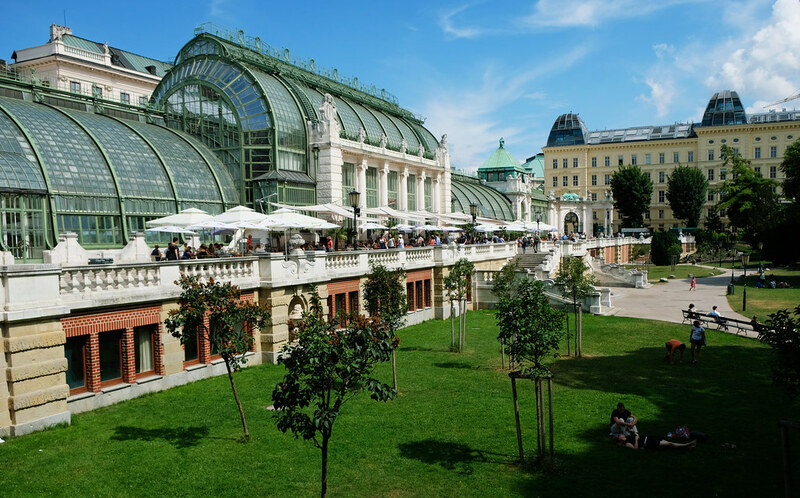 Because Vienna has fabulous parks, and they are in their glory by late spring – and also throughout the summer. 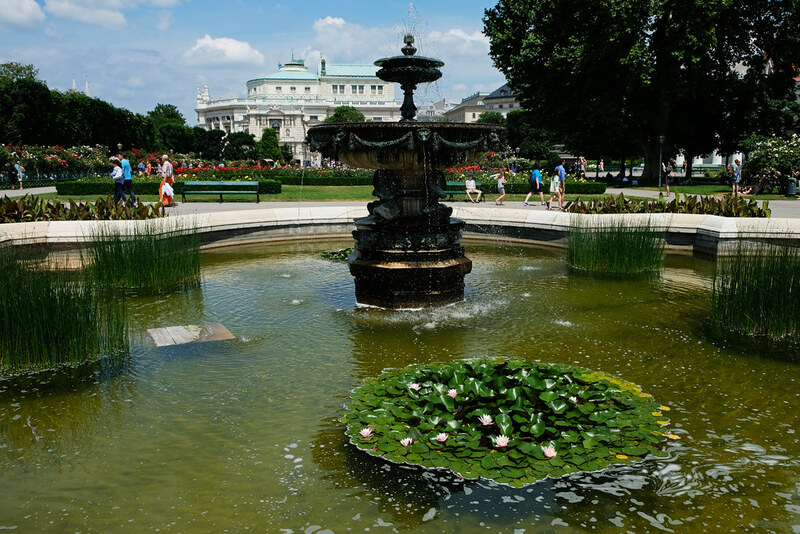 Volksgarten is actually part of the Hofburg Palace in Vienna’s city center. It’s free to enter the park, however it has opening hours: usually from 6 am to 10 pm from April to October, and from 7 am to 5:30 pm from November to March. 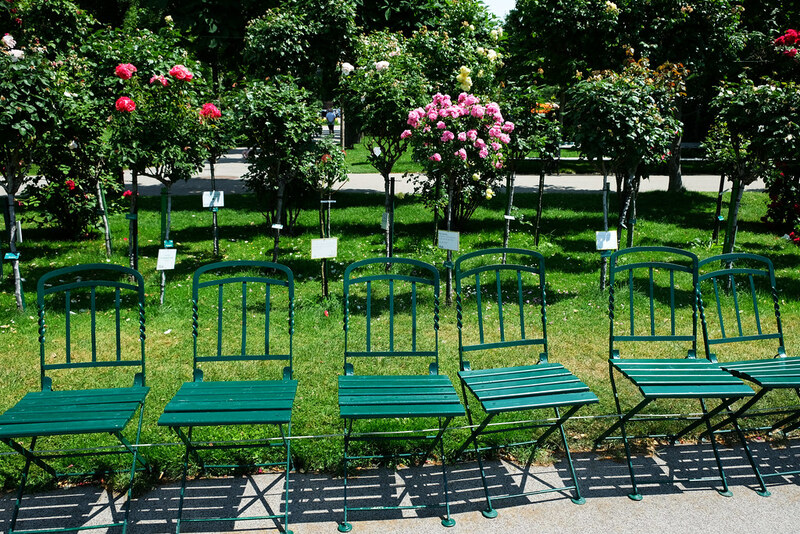 We especially like its beautiful rose garden, its fountains and the marble statue of Empress Elizabeth in a quieter corner of the park. In the center stands the neoclassical Theseus Temple that’s a small-scale replica of the Temple of Hephaestus in Athens. 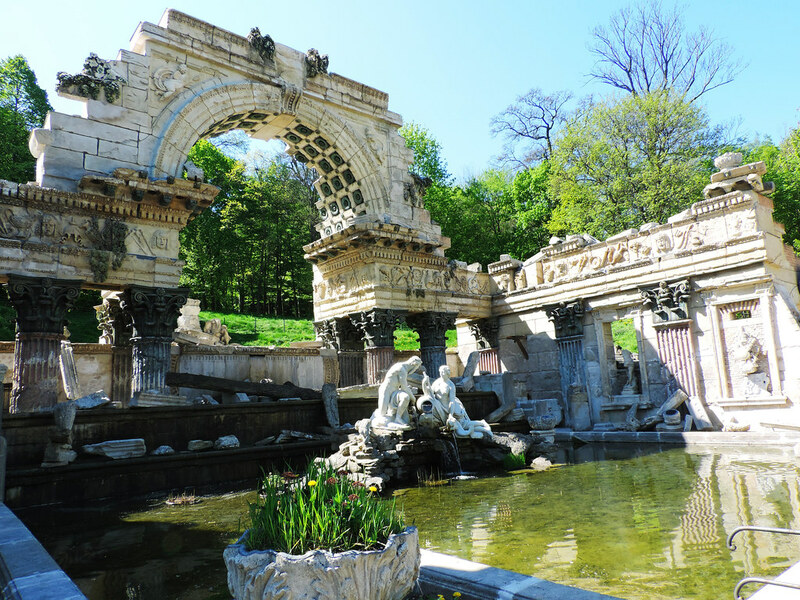 Volksgarten is surrounded by majestic sights. 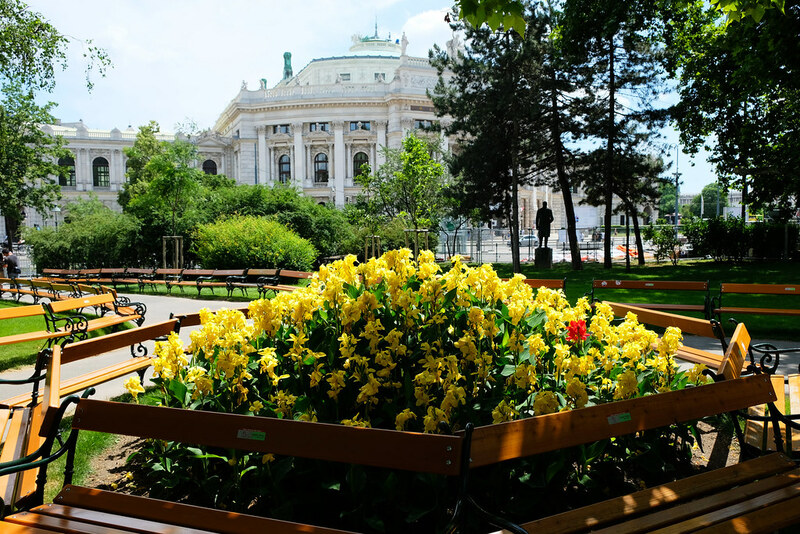 From certain areas of the park, you could get a view of the City Hall, the Parliament, Heldenplatz and the Burgtheater. It makes for a perfect place to relax on a busy sightseeing day. 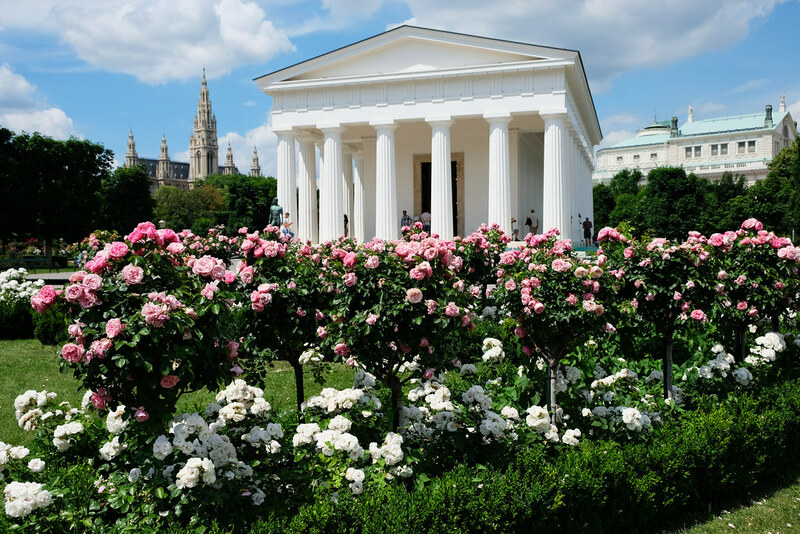 And with all the blooming flowers that fill every corner of the park, it’s one of the most romantic parks in Vienna. On the other side of Hofburg Palace, there’s another garden: Burggarten. Once a private garden for the Imperial family, this pretty English style park is open to the public today. 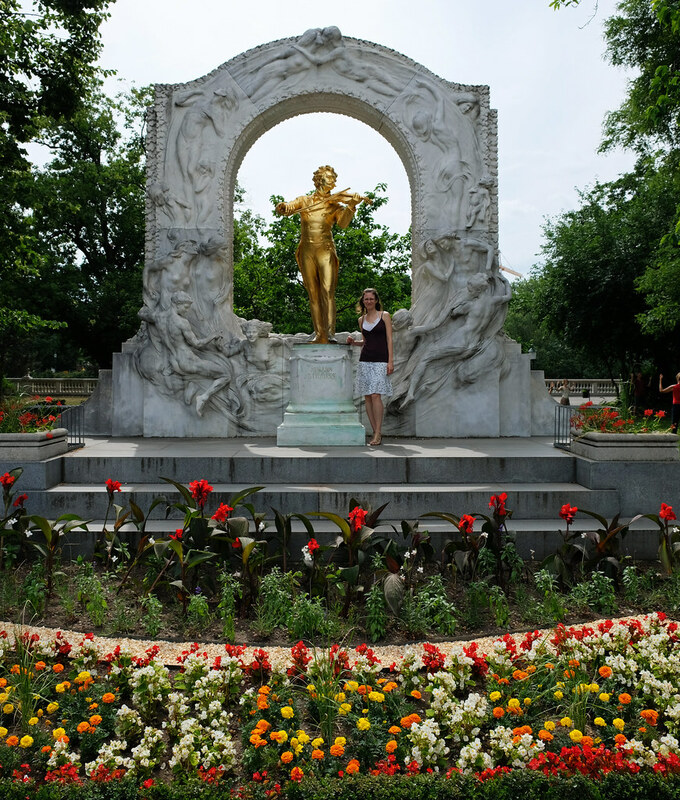 The monument of Mozart greets you at one of the entrances, surrounded by colorful flowers that shape a clef. 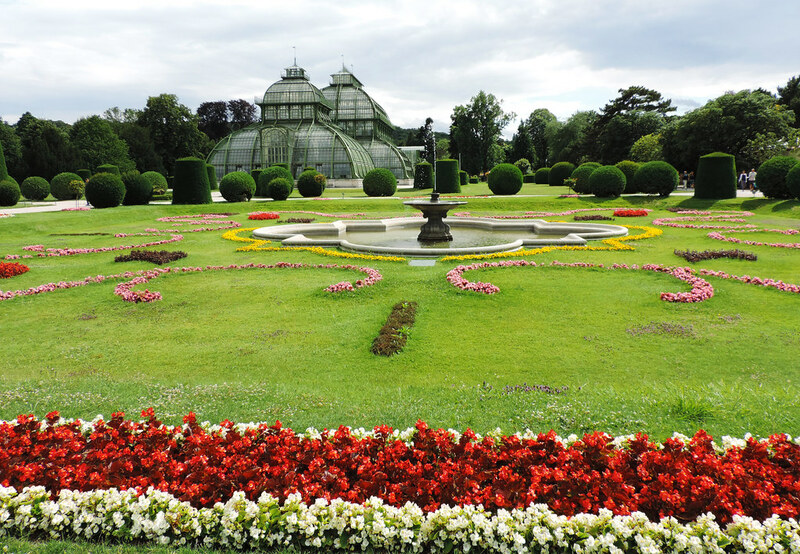 Burggarten offers views of the Neue Burg, and it’s home to the Palm House, a spectacular Art Nouveau glasshouse. In good weather the park is full of people lying on the grass, having a picnic or reading. Rathuasplatz is the square in front of Vienna’s Neo-Gothic City Hall (Rathaus as they call it), and it separates the two halves of Rathauspark that are symmetrical to each other. Meandering paths under large trees lead you through the park. You can rest on the benches while looking up to the magnificent City Hall. Vibrantly colored and carefully shaped flower formations and small water pools make the scene even more pleasant. It’s the largest park in Vienna’s city center, and it’s divided into two sections by the Vienna River. It has a nice lake (with lots of ducks) and large grass areas. Our favorite area is where the building of the Kursalon and the Flower Clock is (it is what it sounds to be: a clock made of flowers). The Kursalon is an Italian Renaissance styled building. 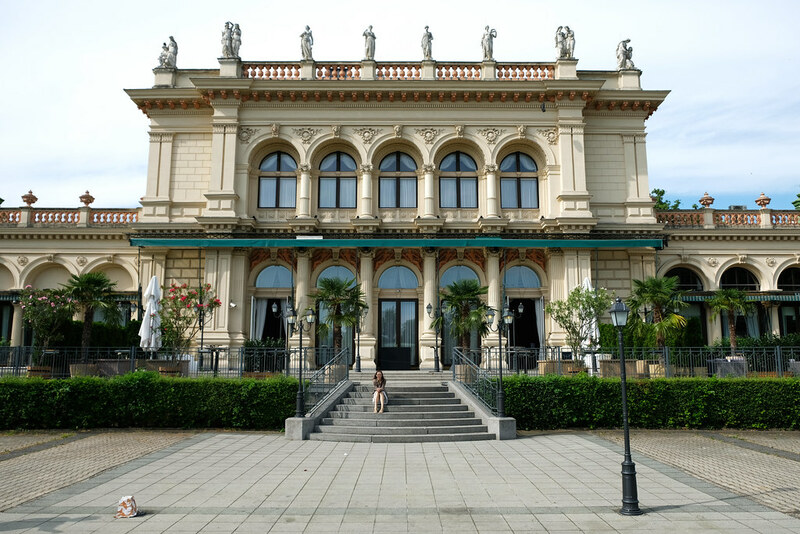 Johann Strauss II gave his first concert here in 1868, and today it’s also used for balls, concerts and nightclub events. It has a restaurant and café, too. Startpark is home to several monuments, including one of the most frequently photographed monuments in Vienna: the bronze statue of Johann Strauss. Finally, we can’t miss two stunning castle gardens that are freely accessible to the public. Needless to say, they are very romantic places to take a walk – with majestic castles as a backdrop, how could they not be? 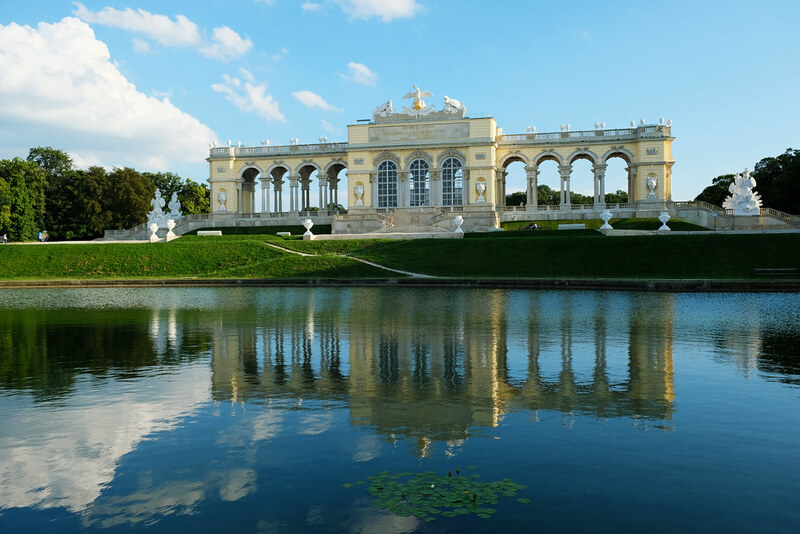 A walk in the gardens of Belvedere Palace is like being in a costume drama film set. They are a masterpiece of Baroque landscape design. The main garden is divided into three large terraces and decorated with fountains, statues, hedges and parterres of flowers that are all symmetric to each other. 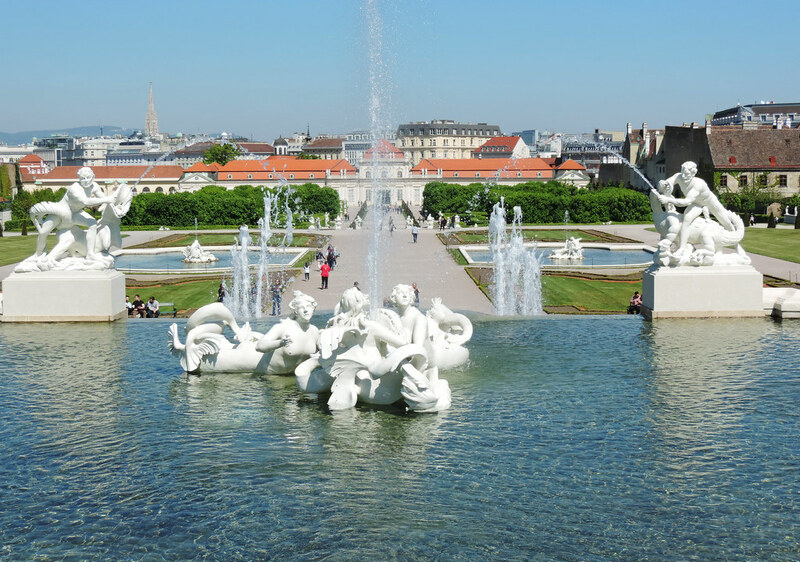 The most spectacular and largest fountain is in the middle between the Upper and Lower Belvedere Palaces. But it’s worth walking to the front garden of the Upper Belvedere, too. The lake in front of it reflects the castle on a calm day – and it’s probably the best spot to take a picture of Belvedere. 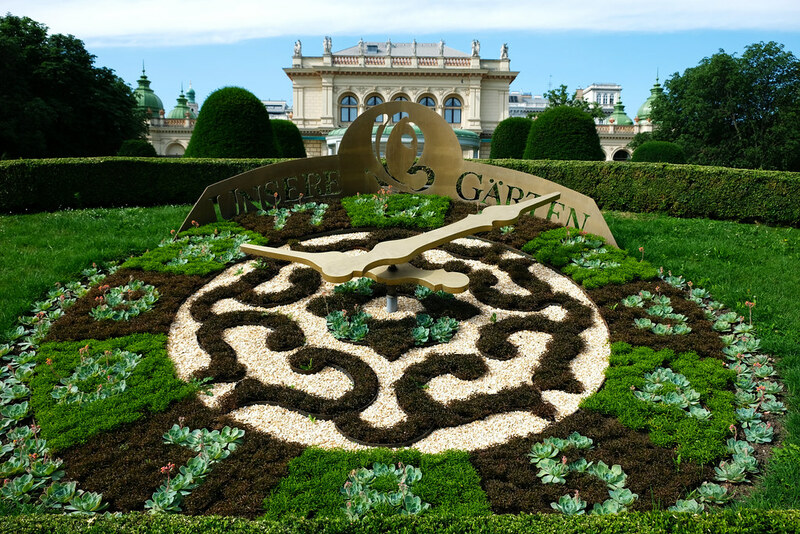 You can check the opening hours of Belvedere gardens here. 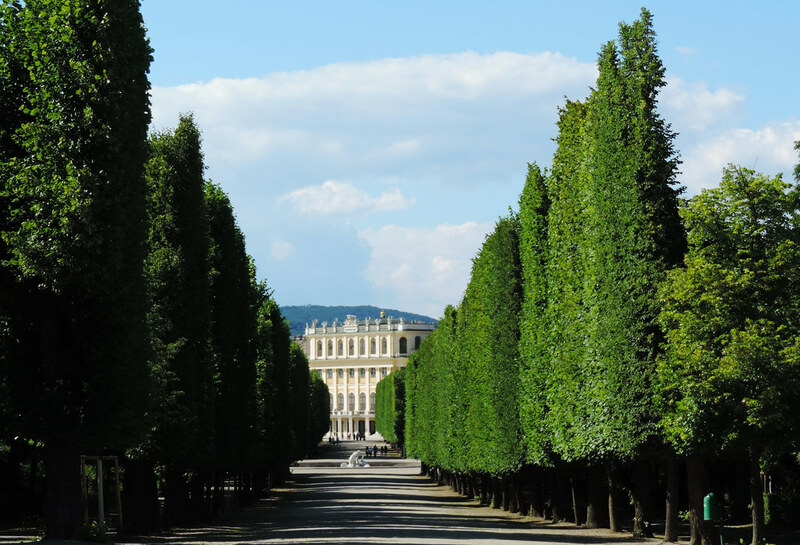 And then there are the enormous gardens of Schönbrunn Palace. Just a word of warning: we can easily spend half a day simply walking in these gardens. And that’s not counting visiting the Schönbrunn Zoo – it’s one of those areas of the Schönbrunn gardens that are not free to visit though. 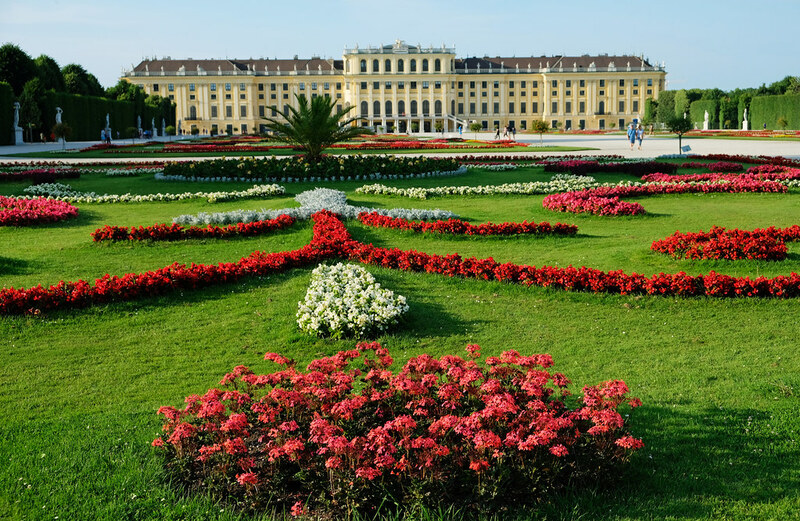 We usually start at the Great Parterre that’ right behind Schönbrunn Palace. It’s a spectacular Baroque garden, symmetric and colorful, and it ends at Neptune Fountain that’s probably the crown of it. Then we wander in the tree tunnels, bumping into statues, smaller fountains and pools from time to time. Another nice garden is the one at the Palm House. It’s not so centrally located and usually quieter, but still full of carefully shaped flowerbeds and pretty little fountains. 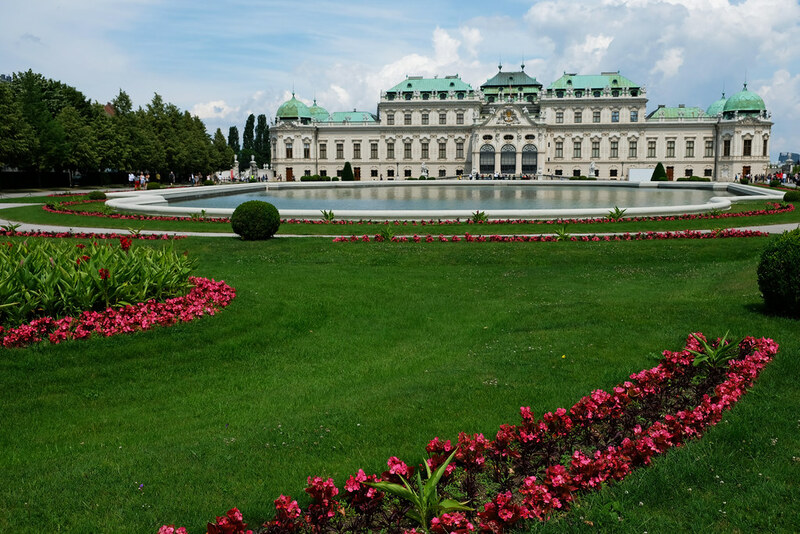 On the eastern façade of the palace lies the Crown Prince Garden – and you need a ticket to access it. However, on the western façade there’s a similarly astounding and free garden with a rose tunnel, fountains, hedges and flowers. 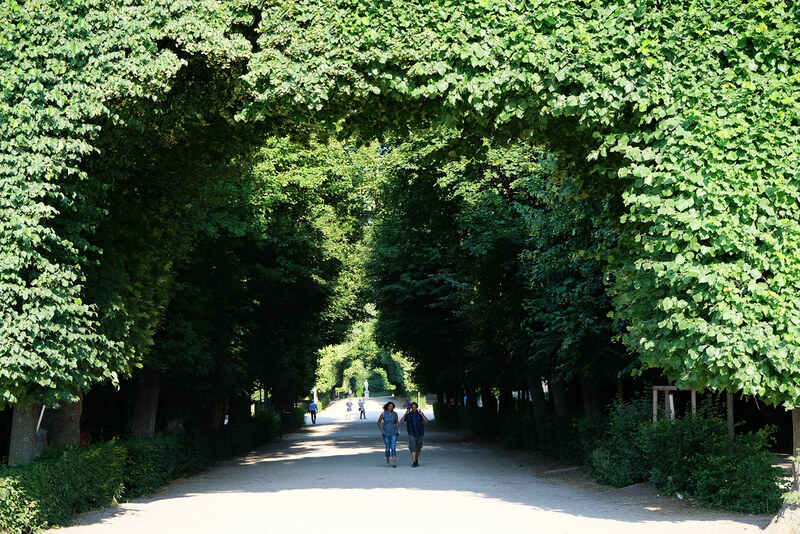 While it’s impossible to recite all the lovely corners of the Schönbrunn gardens, we hope we could whet your appetite to explore them for yourselves. Check the opening hours here. Do you have a favorite city park?